There has always been a special place in my heart for the Negroni. Not always. I stayed away from them in elementary school, naturally. I don't think I even tried my first until well into my twenties. And I'm not quite certain I liked it then. But I liked the idea of the Negroni. It was and is a sophisticated, world-weary drink-- one with Italian origins and bitter complexity, yet remarkably, charmingly straight forward. It is not a drink that should be knocked back like whiskey, nor can it be co-opted or diluted with other ingredients and still be called by its proper name. It is the sum of its equal, co-dependent parts: gin, sweet vermouth, and Campari. It must be savored and considered. If a person could model one's self after a cocktail, I knew that the Negroni was exactly what I wanted to be when I grew up, so I kept trying. So far, so good, and with minimal damage to my liver. The Negroni doesn't have the wide appeal of the Martini or even the Manhattan, which is, in my case, precisely the point. It isn't necessarily an exclusive drink, but it does attract discriminating drinkers. They know who they are. Or, at least, quickly find out who they are not. For example, several years ago, some co-workers and I took a new server out one afternoon for a drink at a place around the corner from our restaurant. It was a warm day, so we decided to sit outside at some little tables on the sidewalk, have a smoke, and get to know our new little friend over a drink or two. "Um, sure. I'll have a nigg--oni, too." Then came the long, extremely uncomfortable silence made all the worse by the fact that she said this to a black man. If looks were hunting knives, she would have been flayed alive by everyone present. What made it all the more surprising was that she hadn't the slightest idea what she had just said. Greg generously attributed her utterance to poor Italian pronunciation, which is more than the rest of us allowed her. And, after all that discomfort, she told us she didn't like her Negroni and sent it back to be replaced by a sweet, vodka-based drink. When she got up to use the restroom, one of our party re-christened her "Chili's" because he felt she might be much more at home working there than with us. The name stuck around for about as long as she did. That drink we bought her as a welcome ended up being her departing gift, too, since that's precisely what she did shortly after. There is a time and a place for the Negroni. Swank apartments at midnight, dimly lit trysting places at any time of day, on the sly in a toney sanitarium-- appropriate situations, all of them. Never, under any circumstances are they to be drunk over a quick lunch with your parents or-- and I speak from personal experience-- are they to be ordered in the jungle borderlands between Brazil and Argentina. Especially if there is a strong language barrier between you and the bartender who only knows caipirinhas. I don't care if there is a casino on the premises, it is to be avoided. 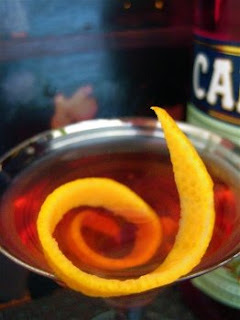 The cocktail owes its name and its existence to one Count Camillo Negroni of Florence, Italy. According to Eric Felten's enjoyable read, How's Your Drink?, Negroni's preferred drink at the Caffé Casoni was the Americano, an admixture of Campari, Cinzano, and club soda. One day, he asked the bartender, Fosco Scarselli, to fortify his drink with gin. The cocktail was an unqualified success and its intake spread first around the city, then the world. 1 ounce good gin. Please do not stint. Ice cubes, preferably made from Italian spring water. Or tap, depending. Into a cocktail shaker, add all ingredients except the orange. Shake or stir, according to your own preference. Strain into chilled cocktail class. Garnish with orange. Sit back, and enjoy the ensuing existential train wreck. As an added bonus, while I'm on the topic of train wrecks, enjoy a clip from a famous television personality I would never in a million years expect to see drinking a Negroni. In my opinion, she doesn't get it quite right, just pouring everything over the rocks without proper mixing as she does. Then again, she does only have 30 minutes to make an entire meal.